October 8th, 1871, a fire that killed more people than any other fire in the history of the United States ravaged NE Wisconsin. Known today as The Great Peshtigo Fire, after the town at the center of the firestorm and which lost the most lives, it has been largely forgotten in the annals of American history. The reason for this is because the fire occurred on the exact same day as The Great Chicago Fire. Chicago, being obviously the much bigger and well-known city, had pushed those lost in the Peshtigo fire onto the back pages of the newspapers of the day, as well as our history books of today. 250 people were lost in The Great Chicago Fire. 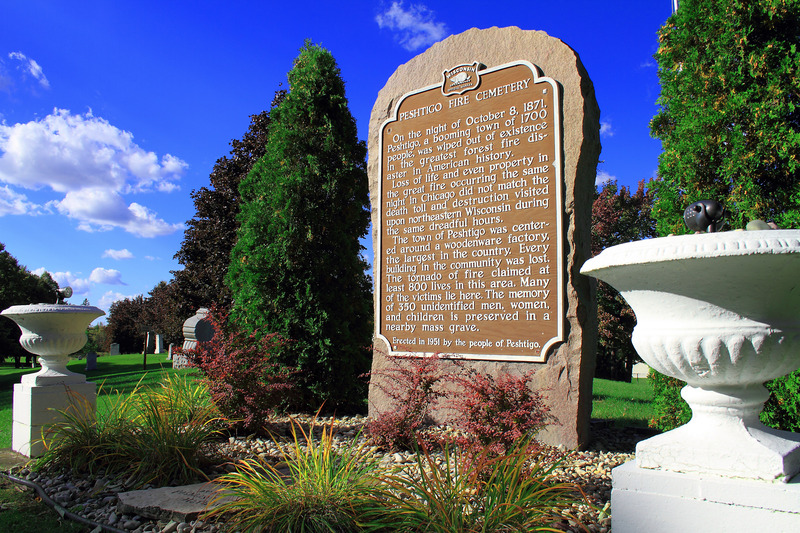 It is still not known today, and never will be known, exactly how many lives were lost in The Great Peshtigo Fire, although the estimates range from 1800-2400. Although seemingly an astonishing coincidence to have two fires of that magnitude only miles apart on the exact same day, it actually wasn’t. The entire upper midwest was experiencing an epic drought that year. The upper midwest being prime logging country made the environment ripe for fire. Writings from the time tell of those in Peshtigo having to cover their faces and mouths to prevent from breathing in ash and seeing the reflections in the sky of multiple prairie fires burning in Illinois, Michigan, and as far west as Minneapolis for weeks before that fateful day. Oconto, WI had a fire just days prior, which many had thought was “The Big One” they were waiting for and knew would eventually hit. They were ready for that one, but they had no idea what was coming. The weather pattern on that day created contrasting fronts which forged winds up to 100 MPH, pushing the many smaller fires in the area into 1 big fire centered over Peshtigo. It was literally a fire tornado. Peshtigo burned in 90 minutes. 800 residents of Peshtigo were dead, along with hundreds more in the surrounding areas, including across the bay in the Door County Peninsula. Some were burned alive, some were killed by flying fireballs and debris, some were killed by simply breathing in the air which was so hot many spontaneously combusted. The reason the number dead will never truly be known is because many of the dead didn’t have bodies left to identify. Those who survived in Peshtigo did so by staying in the river that bissected the town for 12 hours until the air was safe enough to breathe again and not succumbing to the hypothermia which also killed dozens. Bodies were still being found well into the next year. It is still today, 143 years later, the worst natural disaster, in regards to number dead, in our nation’s history. The Midwestern Paranormal Investigative Network conducted a paranormal investigation in Peshtigo in September, 2013, 142 years after the fire. Scott, Vicky, & Jim visited several places in Peshtigo relavent to the tragedy and conducted numerous investigations throughout the day and night. 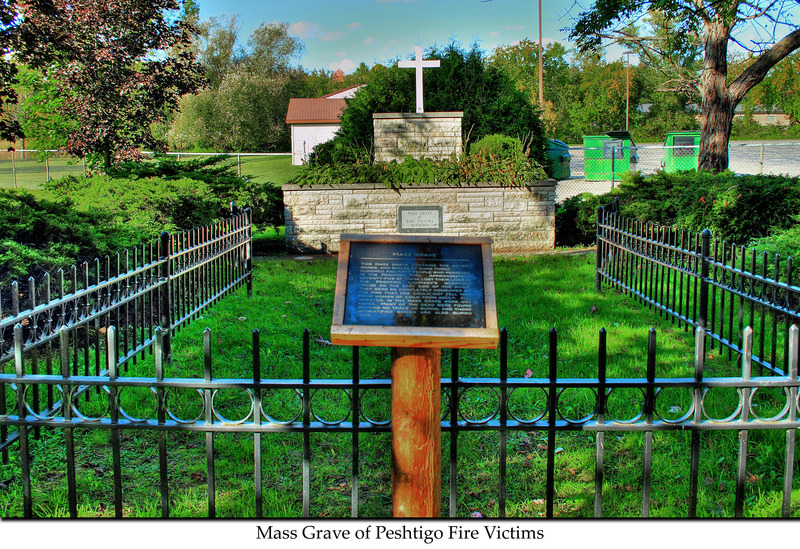 Areas included the Peshtigo Fire Museum, which holds relics from the fire and many other items from the time period, 2 mass grave sites, and multiple sites at the Peshtigo River, where the residents ran to attempt to escape the fire, and many of them were killed. During our review of the evidence, we were pleasantly surprised with what we were able to capture. Numerous EVP’s were recorded during the investigation. Due to the circumstances of this location, in which an entire town was burned to the ground, much of the investigation was conducted outside. Because of this, many of the EVPs are unable to be cleaned up to the point of presentation, as the EVP itself is difficult to distiguish for the untrained ear from the ambient noise. Video evidence can only be interpreted as inconclusive, although there was some very interesting audio captured both on an SB7 Spirit Box and an Ovilus which were quite telling and beyond the scope of coincidence. Vicky sitting alone at the mass grave in the Fire Cemetery. In the beginning of the following audio clip you can hear a gust of wind, and then immediately following is a whisper, stating, “I assumed you’d come here.” A few seconds later, Vicky is heard telling those buried there they have not been forgotten. I assumed you’d come here. I read your story about Peshtigo, I lived there for along time. I have heard and seen things that would curl your hair. If interested please contact me and we can go there and meet others that can tell and show and let you hear things. We are not young people either with bull crap. Hope to hear from you if you want to know more. We would absolutley be interested in coming back to Peshtigo. Talking with people who have had experiences with the spirits of Peshtigo would be an amazing opportunity for us. We would be willing to do another investigation there as well, if necessary. Please email us at exploringtheunknown@yahoo.com if you’d like to set something up for later this spring or summer. Thanks again! Looking forward to it. Hey guys! I was researching our next podcast episode featuring the Peshtigo Fire and found your website. We are going to share your evidence and a couple of the EVPs with links back to here. Thanks for conducting this investigation about a very forgotten tragedy! This will be episode 153.